Every Thursday evening is a must for sizzling steak lovers! Freshly prepared to order, enjoy a locally produced 8oz rump steak provided by Veysey’s the butchers and cooked how you like accompanied with pan fried mushrooms, grilled tomatoes, chunky chips and a dressed salad garnish, plus a FREE bottle of table wine to share too (or two drinks from the bar if you prefer). £25 for two inc. a FREE bottle of table wine (or two drinks from the bar). 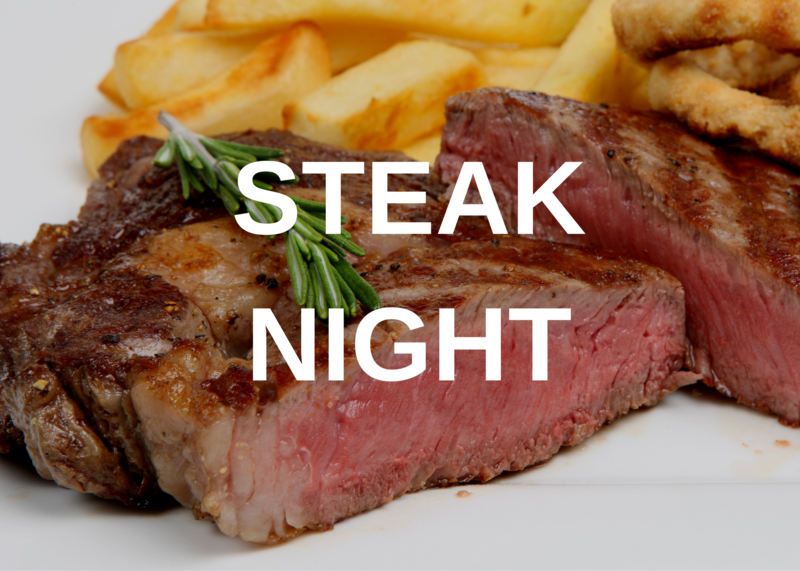 Steak sauces are available for £3pp, choose from Peppercorn, Port & Blue Cheese or Tennessee Glaze (sweet bourbon based southern American sauce). Why not add a portion of onions rings too for just £2.50pp?